Edvard Munch: Between the Clock and the Bed, on view at the Met Breuer (until 4 February), is an easy contender for the most joyless exhibition of the year. But because the Norwegian was so mired in misery, it lends many of his less agonised canvases, such as a Starry Night (1893)—a slumberous coastal landscape from south of Oslo—an intense and hallucinogenic beauty, like something that’s an exception to the unhappy norm, and which cannot last. 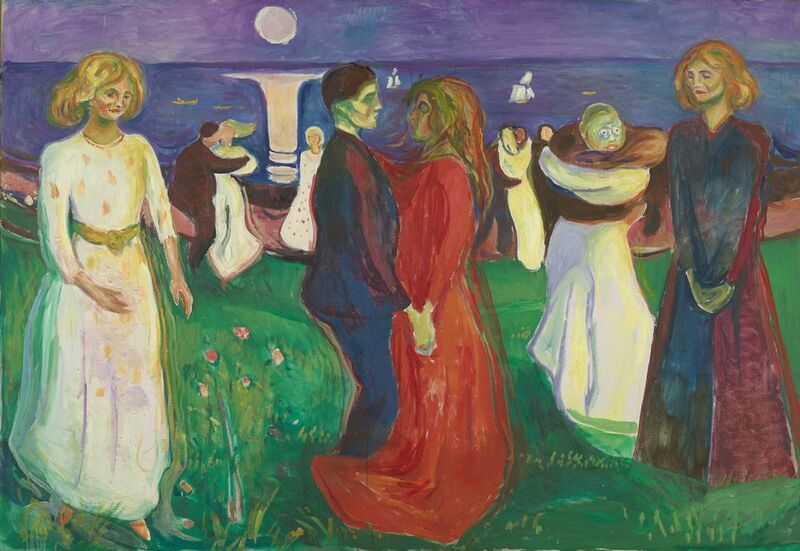 Encompassing 43 works, including 16 self-portraits and many canvases that have never previously been shown in the US, the exhibition bears out the critic Robert Hughes’ assessment that Munch’s “relentless and self-absorbed despair makes everyone else’s spleen look almost kittenish”. The changing face of Islam’s holiest city is captured in the exhibition Ahmed Mater: Mecca Journeys at the Brooklyn Museum (until 8 April 2018). Through photographs he has taken at the site since 2012, Mater shows how rapid modernisation has transformed and Westernised parts of Mecca. He also uses the hajj, or pilgrimage route, to critique the hierarchies that exist between wealthy Muslims and those swept under the city’s redevelopment, like construction workers and migrants. The show, organised in collaboration with the King Abdulaziz Center for World Culture and the group Culturunners, also includes a sculpture, six videos and an ongoing installation made from windows salvaged from historical buildings in Mecca. The Saudi artist, who was recently named the director of The Minsk Art Institute, a cultural platform launched by Saudi Arabia’s crown prince Mohammed bin Salman bin Abdulaziz Al Saud, says that it is “important for me to identify with this place and to understand how this constellation of change, as well as the forces that are shaping it, will affect [my] community”. The feeling that you are being watched can be all too pervasive in a city where CCTV cameras are as prevalent as yellow cabs. But an exhibition at the New York City Municipal Archives reveals just what kinds of activities the New York Police Department has been keeping tabs on over the years—from advocating for free breakfast in public schools to being gay. Unlikely Historians: Materials Collected by NYPD Surveillance Teams 1960-75 (until 28 February 2018) presents a collection of photographs and ephemera that—with a few exceptions—could be seen as a history of social justice and activism. In 1968, for example, the group pictured above successfully fought against Columbia University’s plan to build a gym in Morningside Heights that would have forced Harlem’s predominantly black residents to enter through a back door, while the mostly white student body could use the front door. Other documentation includes photographs of the 1970 Earth Day parade and a programme from a 1963 concert commemorating the Warsaw Ghetto uprising. But visitors should consider themselves warned: the exhibition is under surveillance.